The quality of the audio recording of Bradley Manning’s plea speech suggests that the tape could have been leaked by the government itself rather than some rogue journalist, WikiLeaks activist Clark Stoeckley told RT. RT:The media reported what Manning said during the hearing, why is it so significant to actually hear him say it in his own voice? Clark Stoeckley: I think it is very important for people to hear Manning’s own voice. So far everything has been processed through journalists and finally we get to hear his tone and the conviction in his voice. We can hear that he is a very brave, intelligent young man. And I think this is a very great thing that this has been released to the world. RT:Is it going to effect the trial in any way, because it was not supposed to be leaked, is it? CS: Correct. The court rules say, and every time I go as a journalist, I have to sign a peace of paper that says that I won’t to any recording. I will clarify: I definitely did not record this. I did not leak it. I’m sure that they are going to be clamping down on us. But I am suspicious as to whether they leaked this audio or not. The audio to me sounds like it came from the courtroom rather than press room. There is a lot more chatter in the pressroom and I do not hear that in the audio. And it is also a lot crisper and clearer than what I heard in the pressroom. It sounds like it could be a direct recording from the government. RT:What is the reason for the trial to be held in total secrecy? Surely it would be better for openness and trust to hear what is going on when it is going on? CS: I believe that is the fact. In fact this morning I started a petition on the whitehouse.gov website to petition the Obama administration to allow CSPAN to televise the trial. I know that, it is probably not likely but I think it would be symbolic of the fact that Americans want to see what is going on. This is the largest leak case in US history and whether your opinion of Manning as a traitor or a hero it is still of great public interest and relevance. I believe, it should be available for lawyers, law students, scholars, historians and the general public, especially those who can’t make it to Fort Mead, Maryland. RT:Manning said the main reason behind the leaks is to in some way bring change to US foreign policy. Will he succeed in the end of the day? CS: I do not know if he will succeed in that but he definitely has succeeded in starting a conversation and a worldwide debate. And so yes, he has succeeded in that. 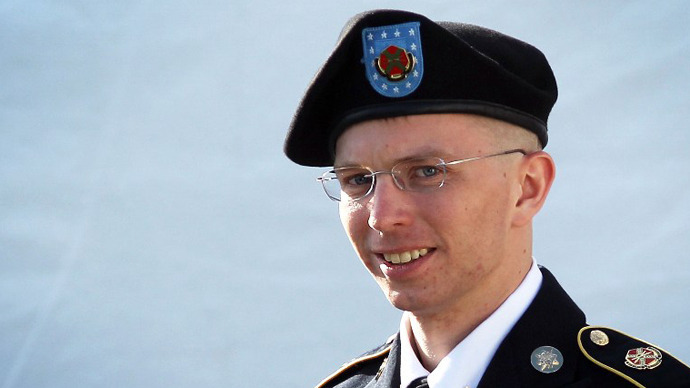 I do not know if our government is open for change and think there is an old guard that keeps the things the old way, but what is ironic here is that Manning has just been nominated for his third Noble Peace Prize meanwhile he is being charged with aiding the enemy. That does not look good for the Obama administration or our military or our government in any way. RT:But leaking military information can jeopardize people’s safety, can’t it? CS: It certainly could but we have not seen any evidence of that in this trial. There has been no evidence whatsoever of any kind of harm done, just simple embarrassment. And I believe that is why Bradley, without any type of provocation, he spoke from the heart, he spoke truthfully. He made it very obvious that he is a truth teller and he is not beating around the bush and he explained why he did this, which really removed the necessity by the prosecution to place him doing the actual crime himself. So he has taken full responsibility for that. What is now the focus is his motivation and he obviously was not motivated to aid the enemy, or to harm the US - he made that very clear. He chose cables and videos that had no national security concerns and he released them so we could have this conversation. And I think it is a disgrace every day that he is in jail. It is a disgrace to our military. It is a disgrace to the promises that Obama made in 2008.